Water Shuttle. Yard Mowing. 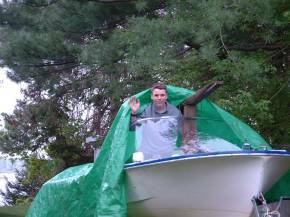 Boat Cleaning. All Done With a Real Smile! 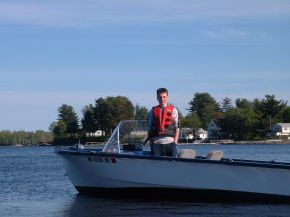 The launching of my 15' Corson 20hp Mariner: Snow Day! 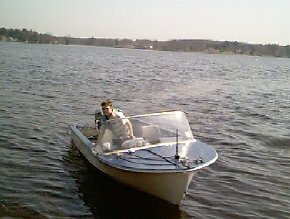 Here I am in April of 2000 checking out the boat that will become the Snow Day. This was my 3rd look. I first checked her out in late Fall of last year. 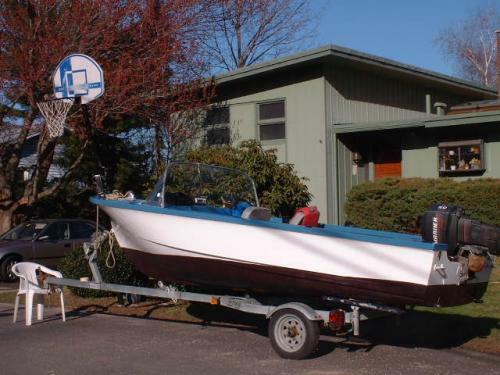 Though she looks a little rough, Gary from Dover Marine assures me that this is just what I need. We finnaly got Snow Day launched 06/17/00 after weeks of delay trying to get her ready. 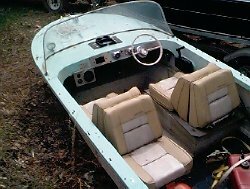 Gary ran into some fiberglass problems, the plywood base under the seats had to be replaced, and we had to re wire most of the electrical system and run new steering cables. And then to top it all off: the water pump failed on the final test! 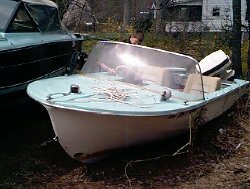 Though fiberglass, Snow Day still moves out under my 20hp Mariner! We saved the Mariner from the sunken Pride 'n Joy last year by getting it tipped upside down and lowering it by rope from a tree into a large trash can of fresh water. 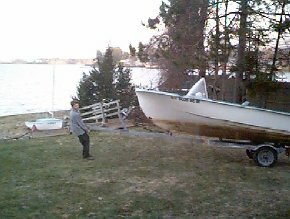 Colin pulling Snow Day into position for 04/20/01 launch off of our beach. Snow Day ready to be lowered down the hill onto the beach for launch. Man! That hill was a lot steeper than we thought! 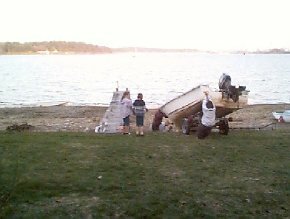 Our friend Gus made the difference by applying a little stopping muscle to keep the trailer and boat from digging into the sand and just flipping end over end. And Marissa hung onto the back for dear life! Thanks for your help, Gus and Marissa! 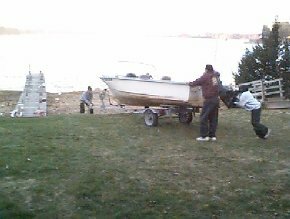 But everything was a success and here I am pulling up to the dock after taking the Snow Day out for her first spin around the bay. I cant wait for the rain to stop to get Snow Day ready for the season! 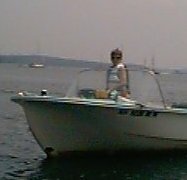 Just got her back from some engine work up at Dover Marine on Friday night, 05/10/02, so I have no time to waste! 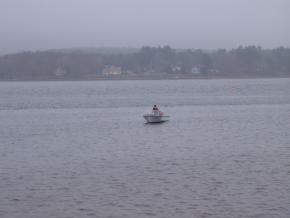 But, I finally got launched Sunday, May 19th with the help of my friend Mike Debelis. And what a great day it was to fly around the bay after the long winter and long wait to get my engine back from the shop for tune up and repairs! It's a good thing, though, that Marissa had her The Wet One launched a few days before and standing by as the "crash boat". I must have had some old gas and my fuel filter ended up plugged. 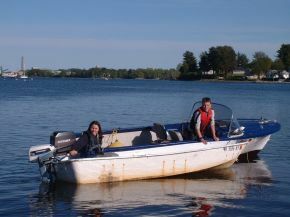 She had to tow me back to shore for repairs. But after that I was all set! Snow Day is all painted and ready to launch. Late start this year (it's already April 309th!!) 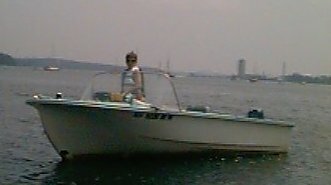 due to the really bad weather and poor business cooperation from Dover Marine who held me up on my engine since January. 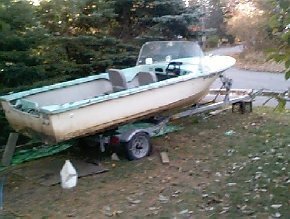 They told me they'd get my boat in January and put a new 50hp engine on it for me. 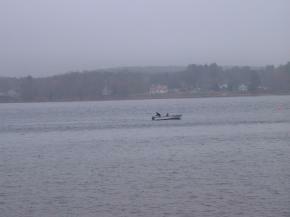 But they never came to get the boat untill mid March. And then they didn't get to it until my dad and I called every day until they finally came and got it. But then they still wouldn't work on it! They promised me they would have me all set by my 16th birthday on the 12th, but that date came and went. 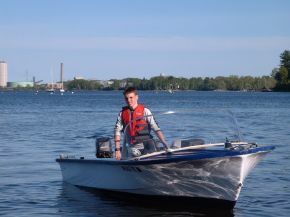 All I wanted for my birthday was to have the new engine on my boat and be in the water. But no. And then 4 days after my birthday they call me up to tell me that they got the engine on but it needed another part. So we waited a week for that. 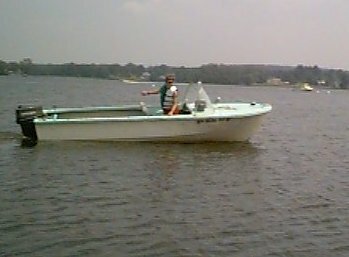 And then they called to say the 50hp engine wouldn't work on my boat because it was a long shaft and would make the boat unsafe. Like they couldn't have told me that back in January????? So, I had them put my 20hp back on and so now I'm stuck the same as I was but for all the aggrivation. It just wasn't right. 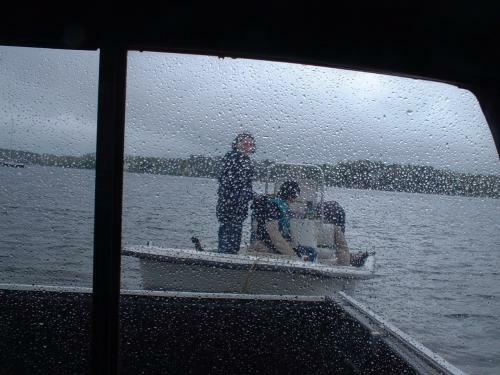 And they told me several times I'd have the boat by my birthday. It's really discouraging that people think they can treat you that way. And then my sister heard their son on the bus say that because of all the calls and stink we made they wouldn't be servicing any more boats from our family! How's that for good business practice? 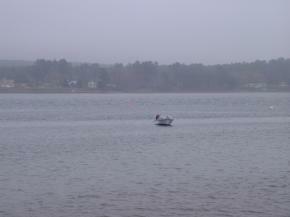 As you can see from this picture, launch day was really tough with wet cold fog. 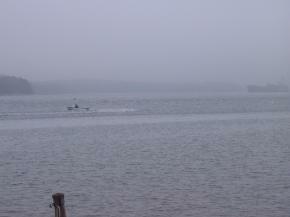 The whole bay is fogged in. 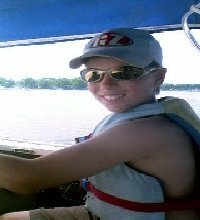 I had my friend Alex with me and it was his first time in ocean water. He loved it despite some bad carry over gas from last year that stalled us out a couple of times. The photographer (my dad) was getting chilled in the onshore breeze and so this was the last shot he took. Close enough to wave good-by to us!